This is a photograph of Vancouver’s downtown, which in recent years has become – in terms of urban development – one of the densest parts of the region. This was the result of a set of inter-related planning decisions, to allow for towers, closely spaced, and mainly for residential use. This was a departure from the way other places kept downtowns for other, non-residential uses. This has allowed for much greater choices in terms of how people get to and from work – and other activities. In most modern cities, built since World War II, the plan has been to allow for most use of cars, which has created large swathes of low density suburbs. Traditionally, prior to motorised transport, cities were designed to allow for most trips to be completed by walking. Railways and streetcars allowed things to be spaced out a bit more, but the greatest impact was the use of the personal automobile. Most North American cities are now turning away from this pattern of development and rediscovering the benefits of urbanity. (Most European cities made that choice much sooner – to retain the amenities and cultural significance of their central areas. ) Not just better energy efficiency, and cleaner air – though both are worthwhile improvements – but in greater interaction between people. More sociability, greater opportunities to meet other people – more culture, more entertainment, more choices of where to go and what to do. Indeed the pursuit of higher densities remains a central plank of urban and regional planning – the subject matter of most of this blog – made possible by increasing the choices of transport open to residents. More trips that can be made without needing a car, by walking, cycling and public transport. That produces happier, healthier places. It doesn’t just protect the environment it increases economic activity. 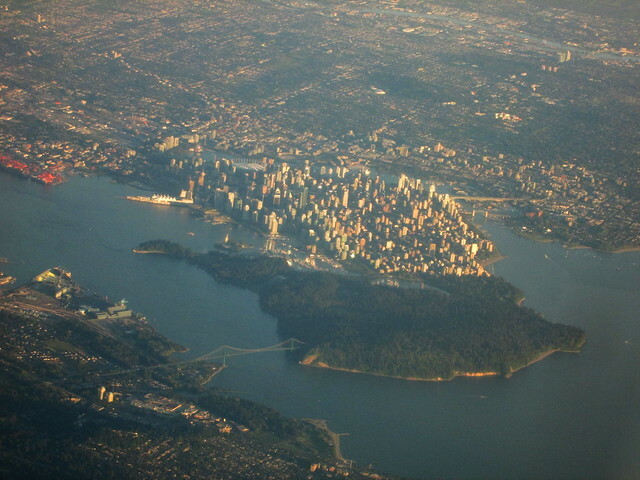 Note too that one important lesson of developing a dense urban core is that green spaces – that’s Stanley Park in the foreground – can be successfully protected and made available for many more people to enjoy, rather than the large areas that get fenced off to keep people out in low density suburbs and exurbs. « Will planting eelgrass help salmon? Dense: Buildings | What's (in) the picture? That’s a great photo. But my overwhelming impression of Vancouver when I was there was how spacious it seemed, and how verdant. Certainly compared with nmany European big cities. The World Economic Forum teamed up with the Massachusetts Institute of Technology’s Sensible City lab to create Treepedia, a website which measures and compares cities’ green canopies. Based on analysis of the density of trees in major world cities, Vancouver has been named as the “greenest” city with the largest tree canopy, followed by Sacramento, Geneva, Seattle, Toronto, Boston and Tel Aviv. It’s interesting to note that about 40% of West End residents never owned cars, and that the traffic onto the downtown peninsula decreased between 12% and 20% (depending on the source) even though the population doubled to just under 100,000 with all the new development in Yaletown, Downtown South and Coal Harbour. Though Coal Harbour contains some of the most expensive luxury apartments anywhere, the fronting Harbour Green Park and the continuous 60 km seawall / park that extends around Stanley Park and False Creek to Spanish Banks demarcates the entire waterfront as a public amenity. That is a major planning accomplishment. He is entitled to his opinion. I think “reasonable privacy” is a very debatable term, and I much prefer not being overlooked at all (something I hated in the rowhouse in East Ham that I grew up in). I also appreciate the view of the mountains- even if it is slowly disappearing behind the trees.